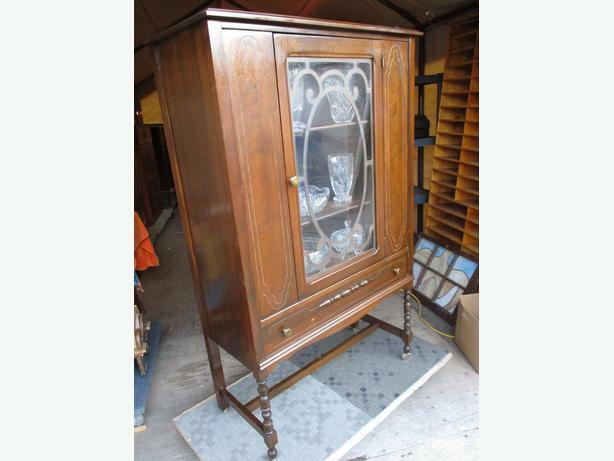 THIS ALL WOOD WALNUT CHINA CABINET IS 16 1/2 INCHES DEEP, 36 INCHES WIDE AND 58 1/2 INCHES HIGH. IT HAS ONE CENTER DOOR WITH FRETWORK DESIGN. THE DOOR COVERS THREE SHELVES. THE TOP TWO ARE REMOVABLE. BELOW THE DOOR IS A FULL WIDTH DRAWER THAT MOVES EASILY. ON EACH SIDE OF THIS DOOR ARE CARVED SIDE PANELS. IT STANDS ON FOUR CORNER POST LEGS. THE FRONT ONES ARE TURNED IN A FANCY DESIGN. THERE IS A CENTER BRACE BETWEEN THE LEGS TO GIVE EXTRA STRENGTH. IT HAS THE ORIGINAL PULLS AND METAL CASTORS. IT IS CLEAN , SOLID AND READY TO USE.